James D. Jenkins is the publisher and general editor for Valancourt Books. He holds degrees in literature from the University of Kansas and the University of Chicago and a law degree from the University of Minnesota. He has published on the Gothic in peer-reviewed journals and spoken on Gothic literature at numerous academic conferences and also lectured on scholarly editing at universities in the United States and Canada. A devoted fan and collector of the types of lost Gothic and popular fiction published by Valancourt, he has edited several of Valancourt's publications and regularly travels with the press to academic conferences to display Valancourt's books and speak with prospective editors. As of June 2013, he resides in Richmond, Virginia. Jay first became interested in Gothic and other lost popular literature as an undergraduate after stumbling upon a small, strange, old black book called The Castle of Otranto in the library stacks. Enthralled by this odd book, which was so much different than all the other old books they make you read in English class, he quickly devoured the few other Gothic novels available in print before discovering that the overwhelming majority of these wonderful books were long out of print and impossible to get. But not anymore, thanks to the efforts of Valancourt Books. Ryan Cagle was born and raised in New Orleans and later relocated to the dark swamps of Acadiana. A horror literature and film fanatic, he focuses most of his energy on reviving titles for our Gothic Classics and Horror & Supernatural catalogues. In addition to scouting out books, he works on getting our titles into independent bookstores and research libraries worldwide, handles most of Valancourt's social media presence and maintains the website. Some of his favorite books in the Valancourt catalogue: The Demon of Sicliy, The Amulet and The Delicate Dependency. 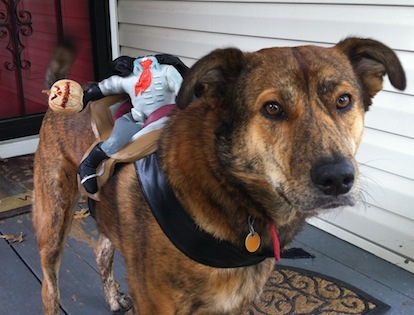 Baron Blood with his headless horseman. When Baron sees us working ourselves to death, he continues trying to keep us in the best of spirits. He also finds unique ways of letting us know when he's hungry. Baron was adopted from an animal shelter in Kansas City in 2007. He's part Australian cattle dog and part comedian. When he's not smiling for pictures or being attacked by the Wolfman, Vathek helps us run the office. Vathek was rescued from an animal shelter in Chicago in 2005. We're not exactly sure what breed he is, but we know that it's a very naughty breed. Most often he can be found laying on top of whatever books we're trying to publish. He also manages the shredding department. Valancourt, our namesake, was a Ragdoll rescued from an animal shelter in Seattle. For the past 7 years he has helped locate books to publish, often by finding them under the couch or table. Valancourt passed away in 2013 after a year battle with cancer but he will forever be part of our family.